In the months-long lead up to that milestone birthday, everyone that I knew spoke in questions. How did I feel about turning 50? Was I freaked out? Miserable? Okay with it? My answer to that never-ending string of queries: I was one-hundred percent fine with the big 5-0. My 40s were "meh" and I looked forward to a new decade and a fresh start. Of course then people wanted to know what I wanted for my birthday. Obvious gift ideas swirled around my thoughts -- jewelry, a trip, a party. Somehow those things didn't quite hit the mark. I wanted something different and meaningful. In the end, the gift idea that floated above the rest was something that needed to come from me. I wanted to run a marathon. My love affair with running began in 1978, when I was 15. It was one year after publication of James Fixx's book on running when I first laced on sneakers and took off around town. My family thought I was nuts -- especially my grandmother. At the time, she lived with us and she would come onto the porch while I stretched and pretend she was Jack LaLanne. She did jumping jacks and counted off with her eastern European accent, grunting between numbers. Then she'd point at me and laugh. It didn't matter; I loved to run. In the late 1970s and 1980s, I'd considered entering a marathon but never got around to it. I was a teenager and then a young adult, preoccupied with friends and my love life -- there wasn't enough psychological energy left for marathon training. As an adult, I took a big chunk of years off from running, only getting back into it in my early 40s -- kinda-sorta running regularly -- and if I ever considered running a marathon, I quickly pushed the notion aside. I figured my marathon-running days had passed. At 49-years-old, in early March, I rebooted my running regimen after a long, cold couch-potato winter and the dormant, but persistent, marathon idea gained traction. As my sneakers slapped the pavement, I thought, Maybe it's not too late. 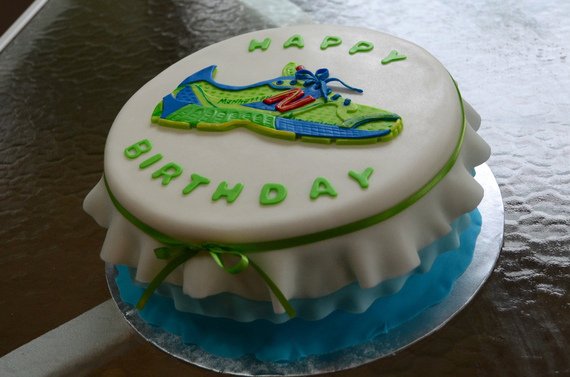 What if running a marathon became my gift to myself for turning 50? I searched the internet for training guidance, after which I decided to give it a try. Then I found the perfect race -- the Raleigh City of Oaks Marathon, scheduled for November. It was seven months away, would allow me ample time to train and the race was in my home city. I researched what to eat, how to refuel, when to rest, and what I needed to wear in hot and cold weather. I told everyone about my birthday gift. The act of telling allowed me to recommit to what I was doing over and over again, something that sustained my motivation as training runs grew longer and tougher. Three months before my 50th birthday, I ran and finished the Raleigh City of Oaks Marathon in five hours and two minutes. On the way to the finish line, I passed my cheering family, my husband taking video as I went by (always fun to watch now, but in my mind I was flying, not lumbering). When I passed the festooned finishers' canopy, I received a medal, a silver warming cape and a bottle of water. I was tired, my left knee ached, but mostly I felt satisfied. Proud. I posed for pictures, grinned and wept. Later that day, I crossed running a marathon off my Bucket List and added a 26.2 magnet to my car. That race was the best way to kick off what I called My Life, Part 2 -- I'd worked toward and accomplished a goal I'd previously considered impossible. Three years later and that magnet is a reminder of the great gift I gave myself. And every time I walk alongside my car and spot it, I smile and whisper, "Happy birthday to me."